As a part of Crestliner celebrating its 65 years in the boat business, it utilized the experience and advice of its Pro Team members to create three models in its brand new Pro Tiller series with the objective of maximizing the advantages of the tiller configuration in a fishing boat. Boatdealers.ca was presented the opportunity to review the largest of these three, the 1850 Pro Tiller powered by the recommended maximum rated horsepower Mercury 90 ELPT equipped with optional power-assist steering. For the uninitiated, a “tiller” boat has no steering wheel or helm console with controls near the center of the boat. A “tiller” boat is steered and controlled entirely from a tiller control arm extending directly forward from the outboard motor at the transom. Think of the all the small 5 and 10 horsepower auxiliary or kicker motors you’ve operated by using that “control handle” and you’ll get the picture. But now visualize of that same type of control “handle” on a 90 horsepower motor and you can almost feel the power and thrust that you’re controlling from one hand. The beauty of a tiller boat is that it’s wide open with no obstructions for moving around the boat, or most importantly, for landing fish when you’re chasing it under and around all sides of the boat. 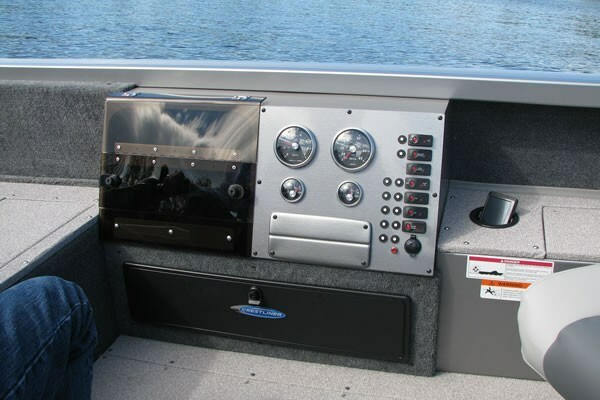 Another big advantage of the tiller design is, because there is no console, the entire boat can be utilized in some way for all those necessary storage and accessory compartments to make your fishing life easier. And in this, the Crestliner 1850 Pro Tiller excels. 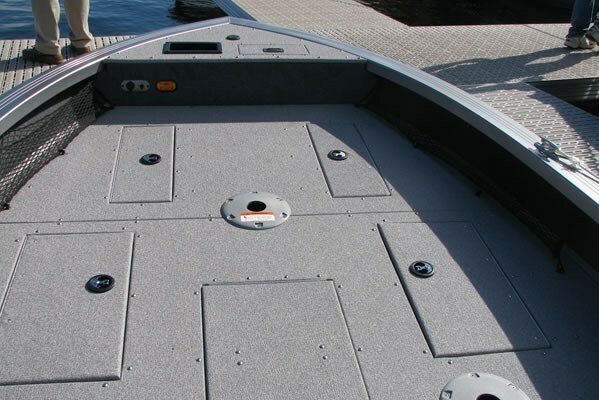 The very large raised bow platform which extends almost half the length of the boat contains both a baitwell and an aerated livewell plus no less than three top-loading storage compartments plus a dedicated rod storage locker. And if even more storage is needed, opt for the two lockable drawers accessible from the front face of this platform. Crestliner Product Manager, Steve Rock noted, “It’s important to locate all of the features of the boat within reach of the driver, and that’s what we’ve done.” The driver of each of Crestliner’s new tiller boats has a dedicated but removable deluxe folding fishing seat located on the starboard side of the cockpit immediately ahead of the stern platform. From a seated position, the 1850 Pro Tiller driver has easy access to a dedicated lockable starboard-side storage compartment for up to 8-foot long rods; a baitwell; an aerated and optionally recirculating livewell; plus two storage compartments – one in the stern platform and one in the center floor. In addition, the driver is spoiled with Crestliners’s portside lockable Command Console which houses the controls, gauges, switches, and breakers plus a pullout tray for even closer visibility of up to a 10-inch electronic screen or multiple smaller units. An optional bottom drawer can be added to this console for even more storage. A total of six seat bases are provided for the two standard fishing seats and more seats and/or pedestals can be added. In designing this new series, Crestliner wanted a deeper boat with taller gunnels to minimize the effects of wind and spray by offering a drier ride and more wind protection. The results are a decently deep (for this type of boat) 17-degree hull deadrise with a substantial overall hull depth of 41-inches and very commendable cockpit depth of 25”, all on a wide 8-foot beam. The tiller arm itself seems enormous and substantive and houses the start/stop function with safety tether cord, power trim & tilt rocker switch, and twist-grip throttle control all at your fingertips. The forward/neutral/reverse control is a separate lever. It might seem strange at first to be controlling such a large boat with such a powerful motor from a position near the transom, sitting almost sideways, and not holding onto a steering wheel, but you’ll very soon get used to it, and then quickly revel in the excitement and instant control you possess. This is a fun boat and totally and instantly responsive to your slightest inputs. On a cool day with a slight chop on Otter Tail Lake in the heart of Minnesota’s prime fishing country near Crestliner’s Little Falls factory, and with two adults aboard and an almost full tank of fuel, the 1850 Pro Tiller held plane at 3000 RPM at 15 mph. A comfortable 4000 RPM produced a relaxing 25 mph, while wide open throttle 6000 RPM brought an exhilarating top speed of 40 mph. Tight manoeuvring at this speed brings instant response from the boat and motor and a requirement to pre-warn others on board of your intentions. Crestliner got the welded aluminum hull and interior design right as the boat was dry and as relatively wind-free as you could expect with nary a rattle. This boat is rock-solid and totally predictable. 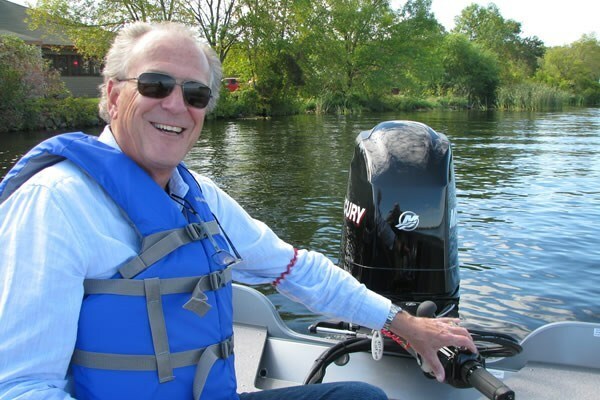 And as stated earlier, it is one fun, practical, and relatively inexpensive way to thoroughly enjoy the fishing experience in a big, roomy boat.